New York Casino Entertainment specializes in casino-themed parties in Queens, NY, and the surrounding areas. 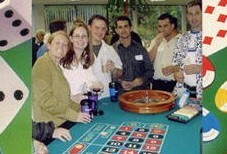 We offer high-quality tables for a variety of games and professional dealers for any special occasion. As a full-service casino entertainment company, we feature specialty products and services such as photo booths, bingo sets and customizable funny money! Our various photo booths can be a fun and memorable addition to your casino night. Our photo booths work by superimposing your guests onto any type of photo scene, which can be customized to complement the theme of your party. Guests will enjoy the experience of taking high-quality glossy photos that they can keep as a souvenir! Funny Money: Customize play money with your company's logo or a photo of the guest of honor. Photo Favors: Choose from many themed casion frames. Sport Arcade Games: Air Hockey, Pop A Shot ( basketball ), Fooseball, Dome Hockey and many others! Bingo: Win big by playing our deluxe Bingo game sets. Money Machine: Grab as much funny money as you can in our custom-made beautiful glass money booth. Call us today to speak with a New York Casino Entertainment representative in Queens, NY, including Brooklyn, Manhattan, the Bronx, Staten Island, Long Island, Westchester, Rochester and New Jersey.